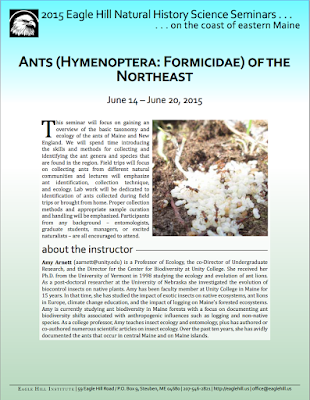 June 14 – June 20, 2015 This seminar will focus on gaining an overview of the basic taxonomy and ecology of the ants of Maine and New England. We will spend time introducing the skills and methods for collecting and identifying the ant genera and species that are found in the region. Field trips will focus on collecting ants from different natural communities and lectures will emphasize ant identification, collection technique, and ecology. Lab work will be dedicated to identification of ants collected during field trips or brought from home. Proper collection methods and appropriate sample curation and handling will be emphasized. Participants from any background – entomologists, graduate students, managers, or excited naturalists – are all encouraged to attend. 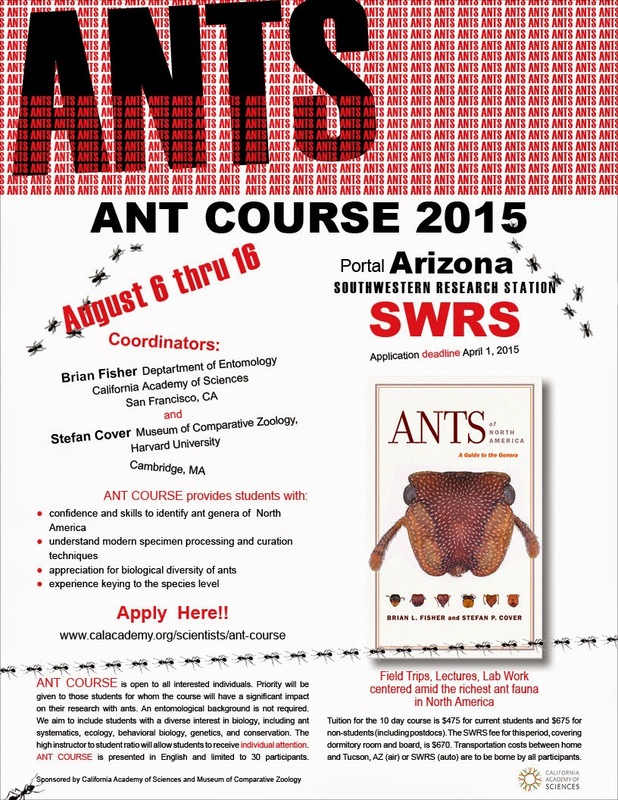 ANT COURSE will be taught at the Southwestern Research Station (SWRS) in Portal Arizona. The Station is centered amid the richest ant fauna in North America. PARTICIPANT ACCEPTANCE CRITERIA.— ANT COURSE is open to all interested individuals. Priority will be given to those students for whom the course will have a significant impact on their research with ants. An entomological background is not required. We aim to include students with a diverse interest in biology, including ant systematics, ecology, behavioral biology, genetics, and conservation. The high instructor to student ratio will allow students to receive individual attention. ANT COURSE is presented in English and limited to 30 participants. COSTS.— Tuition for the 10-day COURSE is $475 for current students and $675 for non-students (including postdocs). In addition, the Southwestern Research Station (SWRS) fee for this period, covering dormitory room and board, is $670. Transportation costs between home and Tucson (air) or SWRS (auto) are to be borne by all participants. SPONSORS.— California Academy of Sciences and Museum of Comparative Zoology. 2015 INSTRUCTORS: Brian Fisher (Coordinator), California Academy of Sciences; Stefan Cover, Museum of Comparative Zoology; Flavia Esteves, California Academy of Sciences; Bob Johnson, Arizona State University, Tempe; Josh King, University of Central Florida; John LaPolla, Towson University; Jack Longino, University of Utah; Corrie Moreau, Field Museum of Natural History; Scott Powell, George Washington University; Andrew Suarez, University of Illinois; James Trager, Shaw Nature Reserve; Walter Tschinkel, Florida State University Tallahassee; Phil Ward, University of California Davis; Special Guests: Raymond Mendez, Howard Topoff.